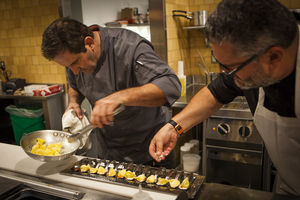 Donato and Gianluca plating bites of the ricotta tortelli with spicy amatriciana sauce. Photo: Nadia Andreini. 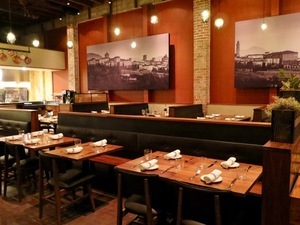 The dining room at the new Donato & Co. Photo: © tablehopper.com. 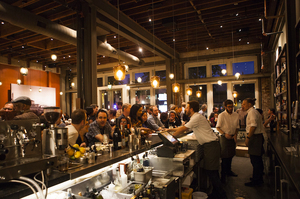 The busy bar at last Friday’s Donato & Co. pre-opening party. Photo: Nadia Andreini. 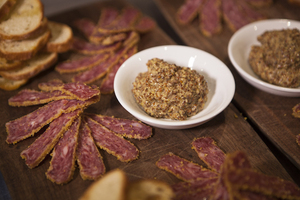 Housemade pitina salume at Donato & Co. Photo: Nadia Andreini. As many of you know, last Friday I helped host the preopening party for ~DONATO &AMP; CO.~, the contemporary Italian restaurant opening in Elmwood from Donato Scotti (of Donato Enoteca and CRU in Redwood City and Desco in Oakland) and his chef-partner in this and future projects, Gianluca Guglielmi, who came from Italy to open Donato & Co.
Grazie to everyone who bought tickets to the party and came out to welcome Donato and Gianluca to the neighborhood! The event was also a fundraiser for The Bay Area Outreach & Recreation Program (BORP)—the duo generously donated $2,000 to BORP! It’s an impressive nonprofit organization that works to improve the health, independence, and social integration of people with physical disabilities through adaptive sports, fitness, and recreation programs, and it is based in Berkeley. It was one heck of a party—Donato and Gianluca put out quite the apericena spread, from housemade salumi (check this out) to quail lollipops to roasted pig! It was a great way to check out some of the dishes they’ll be serving—the housemade ricotta tortelli with spicy amatriciana sauce were fantastico. And hello risotto with oxtail. Check out the menu here. Dishes are going to be rotating often, but you can see the different sections. I’d pay particular attention to items coming off the grill, a highlight feature of the open kitchen, which includes rotisserie chicken. The pricing is also very neighborhood-friendly—they want to see you often. The bar was busy pouring prosecco and making spritzes all night, and I can vouch for the fab Negroni I had late at night at the end of the event. Ahhhhh. That bar is not only spacious, but also well stocked. Enjoy it. The space looks great (Anna Klint of Iron Skirt designed it)—it includes a 20-foot bar and seating for 120 guests in the main dining room. There are booths and comfortable chairs and lots of wood and huge images of Donato’s hometown, Bergamo. And then there’s that state-of-the-art Constellation and Libra acoustic system from Berkeley’s renowned Meyer Sound, which makes for the best dining room acoustics. Hours are Mon-Thu 5pm-9:30pm, Fri-Sat 5pm-10pm, and Sun 5pm-9pm. 2635 Ashby Ave. at College, Berkeley. —Open today (October 10th) on Piedmont Avenue is ~BELOTTI BOTTEGA~ from Michele Belotti of Belotti Ristorante e Bottega in Rockridge. It’s more of a takeout/quick-serve concept. “Fresh pasta, sauces, and appetizers will be available for purchase during the soft opening. Full capacity menu and online ordering will be available shortly!” 4001 Piedmont Ave. at 40th St., Oakland. I’ll have more news for you next week on new projects!